EOS 400D set to meet massive consumer demand. Canon today announces its next generation D-SLR: the EOS 400D. Featuring a 10.1 Megapixel CMOS sensor, new EOS Integrated Cleaning System, larger and brighter 2.5” LCD and 9-point AF, the model is predicted to take the lead as the world’s most popular camera. 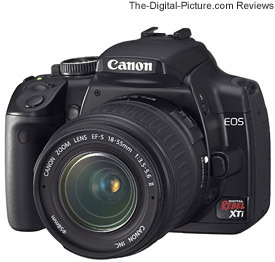 It is positioned above the EOS 350D, currently the fastest selling SLR camera of all time. Canon’s EOS 300D, the world’s first consumer D-SLR, kick started a digital revolution in 2003. “We are now witnessing a mass consumer trend towards D SLR,” said Mogens Jensen, Head of Canon Consumer Imaging Europe. Fully compatible with all Canon EF and EF-S lenses and EX-series Speedlites Canon is the only D-SLR brand to own and manufacture the sensor, processor and lenses in house. “EOS photographers benefit from 20 years of ongoing research investment into EOS,” said Jensen. “EOS photographers have the great advantage of owning a system camera in which every element is designed at a very fundamental level to work as a balanced, integrated whole. It is one reason why more than 70% of registered photographers at the Athens Olympics shot on EOS.” With EOS, Canon aims to provide consumers with the widest and most expandable camera system available, including over 60 EF lenses and Speedlite flash units. As well as the EOS Integrated Cleaning System, the EOS 400D incorporates a number of developments over the EOS 350D. Resolution increases from 8.0 to 10.1 Megapixels, using the superior hi-sensitivity, hi-speed, low-noise CMOS technology now found in all six EOS Digital models. At nearly twice the size of the EOS 350D display, the 2.5” hi-resolution LCD is the brightest in the EOS range and now displays all of key shooting and user interface information along with image playback. The AF system expands from 7 to 9-point, with a highly sensitive f/2.8 center point for exceptional performance in low light. Even with the image resolution increase, maximum frame burst almost doubles from 14 to 27 large JPEGs and from 5 to 10 RAW. Internal camera mechanisms are designed to minimise dust generation. The body cap is redesigned to prevent dust generation through wear on the cap itself. A Self-Cleaning Sensor Unit uses hi-frequency vibrations to shake dust from the low pass filter for approximately one second after each start up. For instant shooting after power up, this feature is disabled immediately the shutter release is depressed. The EOS 400D inherits a number of advanced features proven in higher-end EOS models, such as the EOS 30D and 5D. These include its 9-point AF system, Picture Style (see Appendix: Technologies Explained), 9,999 image capacity folders and expanded Pictbridge functionality. The EOS 400D also incorporates the same DIGIC II processor found across the EOS range right through to EOS 1 professional models (see Appendix ‘Technologies Explained’). As well as providing superior image quality through advanced rendering algorithms and almost instant 0.2 second start up time, DIGIC II’s accelerated processing prioritises the photographer’s ability to keep shooting by clearing the buffer quickly between frame bursts. Consistent with the entire EOS Digital range, the EOS 400D is supplied with a comprehensive software suite to help the photographer’s workflow. This includes Digital Photo Professional (DPP), a powerful RAW converter that provides complete RAW image processing control. DPP also integrates with camera features such as the Dust Delete Data and Picture Style. The camera also comes with EOS Capture, Image/Zoom Browser and Photostitch, plus 100MB of personal online space on CANON iMAGE GATEWAY, Canon’s online photo sharing service. Picture Style pre-sets simplify in-camera control over image qualities. Picture Style pre-sets can be likened to different film types – each one offering a different colour response. Within each selectable pre-set, photographers have control over sharpness, contrast, colour tone and saturation. The camera’s factory default configuration is set to deliver immediately-usable JPEG images without need for additional menu settings. Picture Style presets applied to a RAW image do not degrade the image in any way and can be revised with Canon’s Digital Photo Professional software. The six pre-sets include: Standard – for crisp, vivid images that don’t require post-processing; Portrait – optimises colour tone and saturation and weakens sharpening to achieve attractive skin tones; Landscape – for punchier greens and blues with stronger sharpening to give a crisp edge to mountain, tree and building outlines; Neutral – ideal for post-processing; Faithful – adjusts colour to match the subject colour when shot under a colour temperature of 5200K; Monochrome – for black and white shooting with a range of filter effects (yellow, orange, red and green) and toning effects (sepia, blue, purple and green). The User Defined Picture Style can be used to store up to three customised pre-sets, or any of the pre-sets available for download from Canon’s web site. Now found across the EOS range, DIGIC II is a purpose built, dedicated image processor responsible for the high speed calculations necessary in order to providing exceptionally accurate colour reproduction in real time. Canon’s second generation imaging engine, DIGIC II performs the duties of a number of separate processing units to speed processing, save space, and optimise battery life. Canon’s processor overcomes the trade-off faced by other manufacturers between camera responsiveness and image quality. With its massive capacity, DIGIC II treats every image with the full complex processing algorithms required in order to deliver superb EOS picture quality, while enabling extended continuous shooting bursts. Canon’s CMOS technology is one of the company’s key competitive advantages, with noise reduction circuitry at each pixel site delivering virtually noise-free images. In comparison with CCD technology, the lower power consumption characteristics of Canon’s CMOS sensors also help optimise battery usage. CCD sensors use a bucket relay system to transfer each pixel’s accumulated electrical charge to a corresponding gutter. The operation is time consuming and draws considerable power. By contrast, signal conversion in Canon’s CMOS sensors is handled by the individual amplifiers at each pixel site. Unnecessary charge transfer operations are avoided, vastly speeding up the process of getting signal to the image processor. Noise generation is reduced, power consumption is limited and faster frame rate potential is increased.